Home » Interesting Discussions » Your Say: Do you have dry/dehydrated skin? How do you treat it? 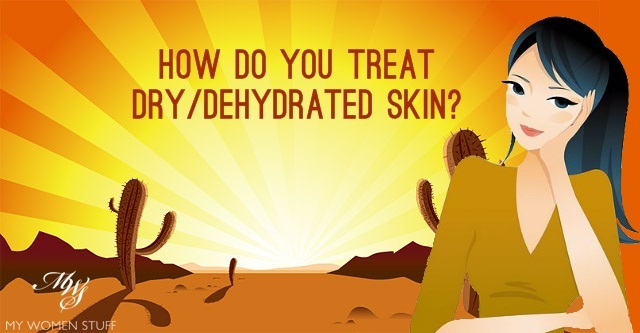 Your Say: Do you have dry/dehydrated skin? How do you treat it? Upon working this out, I have worked out different ways in which I use various types of skincare products to balance the hydration levels in my skin which helps my skin be more “normal”. As normal as it can be anyway LOL! How did I work out that I had dehydrated or even dry skin then? Well here were some signs I noticed (this isn’t gospel but it’s a starting point) and remember, age plays a part too, as does climate, weather and lifestyle. lack of elasticity – I noticed that when my skin is dry or dehydrated, it seems to “hang” rather than bounce back and that of course, makes you look older too. I start off by a floral water mist (I usually use the ones by Melvita although you can use any mists) and then while my skin is damp, I apply a hydrating lotion (toner) followed by a hydrating serum and then a facial oil and a moisturiser. The layering of products that help add moisture to the skin in thin layers helps my skin far better than piling on a thick layer of cream. Using a lightweight serum and cream targeted at hydration too helps the skin. But use thin layers. You can use a serum like Hydraluron which works well or any other similar product that helps boost moisture and retains it in your skin. I personally prefer Dr. Lewinns Line Smoothing Complex S8 Super Hydrator but as it isn’t available here, the alternative available locally will be Hydraluron. Our bodies are 70% water and we need water to stay hydrated so be sure to drink sufficient water (not just liquids as tea, coffee and sugar waters dehydrate the body, not hydrate it) throughout the day. Drinking a jug in one go doesn’t do it. It’ll unbalance your electrolytes. Just have a glass of water every hour or so. 5. Is your cleanser too drying? I had been using cleansing oils for years and thought they were all I ever needed until I realised that my skin was feeling stripped and dried out from using them. No amount of hydration or products would help so I eventually switched away and my skin has felt so much better since! It comes down to paying attention to what you use and how your skin feels. So, pay attention! Contrary to point No. 4 above, gentle exfoliation can actually help skin feel and look better and not so dry/dehydrated. From personal experience, when I exfoliate (I use a face flannel daily which performs a gentle exfoliation and a AHA based toner once or twice a week) it helps my skin absorb my hydration products more readily and effectively. It facilitates cell turn over and that can also help your skin look better. Do you have dry or dehydrated skin? How do you deal with it? Me! Me! I used these set of skincare products that causes even more dryness due to the AHA content so now after ditching them, I am happy to announce that my patchiness and flakiness are kept at bay. No.5 is something very, very true. Many who live here is malaysia tend to search for cleansing foams that foams up really well to give them a clean, squeaky feeling. Foam can be very harsh on the skin, actually. That’s true about foaming cleansers. I never realised how much they stripped my skin yet to an extent most if not all cleansers will strip skin moisture to a degree. It’s just a matter of finding one that makes us feel the most comfortable. I learnt it the hard way when I was over-exfoliating my skin back in those days when my skin was very congested and problematic. I thought that was the way to go until the surface of my skin got really dry and my skin produced more oil, making problems even worse. Thanks to your post years ago I realised that hydration is key. little did I know (and little did most beauticians know too) that the secret was to hydrate. on the drinking fluids part, I’m so lazy and have never succeeded in gulping 2L of water daily. I wonder how some people can do that so easily. I forget to drink sometimes and only realising it when I start feeling really thirsty. I know what you mean Juan. So often when you have oily or congested skin, the first thing you’re handed is some drying anti-acne product and exfoliator so you can “remove the dead cells and unclog skin” If only it was so easy! You know that post was my lightbulb moment. Born out of a moment of desperation I realised that drenching my skin in moisture (not necessarily heavy creams) helped it so much more than all these anti-acne stuff ever could! As for drinking more water, one suggestion is to set an alarm to go off every hour so you remember to drink. At the office, I have a big bottle on my table so it’s easy to remember. But at home, I too tend to drink less coz I forget so these days, I carry a bottle with me at home too! me too have been battling with dry skin for a few years now, i do notice that cleansers play a huge part in the entire routine because they are the first thing that will strip off the moisture. i have long converted to milk cleanser in the morning, and double cleanse with milk and cream cleanser in the evening. milk cleanser somehow helps to create a barrier to prevent water loss from cleansing. and the best milk cleanser i have ever used will be from decleor. now the cleansing part is settled, it will be the forever search of the perfect moisturizer/oil. Gosh I don’t even remember when my skin was combi-oily anymore LOL! Yes it definitely needs more exfoliation to keep things at bay. Perhaps that’s why the Clarisonic works for you coz it sure played merry hell with my skin! I’m always finetuning as I go, depending on how finicky my skin gets. These days, I’m just all about oils! I have exactly that kind of skin. Used to be So confusing n annoying when it comes to skin care. U use those for combination skin, its not enough & u look kinda dull. U use those for dry skin, u will get slime n pimples all over. I have changed my products since a year ago& now pretty happy with my skin. I use milk cleanser after removing make ups with n oil make up remover. Then pat whole face with a hydrating moisturiser before sleep. Then waterbased moisturiser mixed with facial oil. Daytime i just wash my face with a milk cleanser then straight to hydrating sunblock + facial oil if it is wintertime. Spot treatment once a month during that hormonal time. Once a fortnight gentle exfoliation followed by hydrating mask/sleeping mask. I dont use those creams for dry skin anymore. That’s my skin type too. I use the serum and moisturizer from the Origins Make A Difference range and that has worked well for me for the past 5-6 years. I would really like to try out the Hydraluron but it’s difficult to get hold of it. Must put it on my shopping list the next time I head down south. Aside: I love the Origins MAD Plus+ moisturiser! It’s my day cream and I just finished a tub! horrors! LOL It’s a pity that Hydraluron is so hard to get to. It’s ridiculous really. It should be more accessible! I’d like to respond to your comment as I too, have eczema. Although I’m no skin specialist, I’ve found through my years of battling eczema that that statement about moisturiser is only partly true (in my case anyway). Eczema normally affects the top most layer of your skin and when that occurs, your skin is no longer in the state of being able to self-sustain the layer of protection that people with regular skin have to retain hydration levels. That’s why people with eczema usually have it in tandem with dry skin and are more dehydrated in comparison with a regular person. This is also why moisturisers that work for normal skin seldom have as much effect on eczema skin. The purpose of application of moisturiser is usually to deliver a quick shot of hydration directly to the affected skin surface, to enable the skin to ‘repair itself’ and hopefully, perform like it is supposed to. Having said that, external application of moisturiser without sufficient hydration internally will only help your eczema to a certain extent. You will need to hydrate both internally (by getting enough fluids) and externally (with a good moisturizer or barrier protectant) in order to get the best results in managing eczema. I find that this goes hand in hand for me. Thanks for helping out Rinnah! I’m using Alpha H Liquid Gold and also the Hada Labo refining toner. I find that if my skin starts looking dull then a few days using an exfoliating toner helps get things going again. I’ve heard the Clarins Exfoliating toner is good too so I might try that another time. How do you find the Alpha-H? Good to use? I have the same question like Wynnce, what AHA toner do you recommend? I’m using Alpha H Liquid Gold at the moment and sometimes the Hada Labo Refining Toner which I’m not sure if it’s AHA based. I’m thinking of trying the Clarins Exfoliating Toner some time. Every facial I go to seems to declare that my skin is dehydrated. LOL. My skin is combination and might have reverted to normal according to the Kanebo facialist I visited in November. I guess the best thing for dehydrated skin is besides drinking at least 2 litres of water per day is to incorporate more hydrating products into your skincare. Some changes to my skincare over the last few months is Olay Pro-X tool, using Bioderma micellar water instead of cleansing oil, regular hydrating mask, Hydraluron and Olay Night Resurfacing Essence. Not sure if it has made my skin better though but I rarely get breakouts or flaky skin although I do have dull skin sometimes which is not helped by my dark eye circles. Have you heard about the skincare that you are using not actually penetrating the surface of your skin and just sitting at the top layer due to lack of exfoliation and massage and if yes, what are the signs? I was told that I have this problem by the same Kanebo facialist but I find that it is difficult to determine if what she said is actually true. Thanks for the insights. I am guessing you only use an exfoliating tonner a few times a week and not everyday right? Caroline Hirons recommended the Clarins Exfoliating Toner as well but I think recently, she cautioned her readers to not use it everyday like she did because it might be too drying for the skin. Since I cannot really get my hands on Alpha H Liquid Gold in Malaysia, I might be tempted to add the Clarins toner into my skincare steps. I have recently experienced dry dehydrated skin, due to weather and I’ve been spending most of my time in airconditioned rooms. I am using the Olay Regenerist line, w/c I believe is geared toward a more mature age group. At night I’m using the Revitalising Night Cream and Night Resurfacing Elixir. I find that it’s not enough for my dehydrated skin so I layer Laneige Water Sleeping EX. At day, use Olay Regenerist Day Cream. About a year or so ago, I used Laneige Water Sleeping Pack sparingly, once or twice a week because it used to give me breakouts. But now I use it every night and it’s sufficient enough that it keeps my skin from drying out. I’m not too sure if I have the same skin condition as you but what you said sounds very familiar LOL. Maybe I can send you a picture. I drink fresh milk and exercise 3 times a week minimum to keep my skin acceptable to me and so far I’m pretty happy most days lol. Haha I’m no expert ST 🙂 Drinking milk and exercising regularly definitely helps keep skin looking good. I don’t take milk as I’m lactose intolerant and I’m working on exercising but I”m lazy haha! Oh yes, of cos inspired by you I picked up the kiehl’s MRC for evening use. Thx! I just layer it on and zzz. Tried to mix Estee ANR b4 but it made me broke a little. Prob too rich? Hope you like the MRC! Yes maybe the combination is too ‘powerful’. I do have drier skin than most other bloggers around so it might be why it works for me. Enjoy! All the while I thought my skin was oily, until I went for facial and was told that my skin was actually dehydrated and how it made my face oily/combination. Ever since then, she recommended milk cleanser to me and i stopped using foam cleanser. True enough, my skin has been improving. That’s great to know Florence! I too found out at a facial about dehydrated skin and I was all “How can? My skin feels oily!” Isn’t it interesting? At the very least it helps us address our problems and you’re right about anything mattifying or shine or pore control. All these things are really drying to the skin and I don’t think anyone should use them for a prolonged period of time. I definitely have combination to dry to dehydrated skin! I do try to drink water and use serum’s and oils but at the same time I also need to use exfoliators like glycolic acid and salicylic acid since my skin is prone to acne! yet to try hydrating toners…which one would you recommend? I find that a hydrating toner after a peeling one really helps the skin too. For hydrating toners, I’m using the La Mer The Treatment Lotion, Estee Lauder Micro Essence Lotion interchangeably. I also found that the Estee Lauder Nutritious Toner was very good and hydrating too and if you can get hold of it, Hada Labo Super Hyaluronic Acid lotion. I have normal skin with some dry areas, on my left cheek (yes, just one of them! weird, I know) and around my nose. My skin is dehydrated normally during sep to nov, when there is change in weather. Or when I travel and experience that kind of change in weather. After I have learnt to deal with acne from the inside out by reducing inflammation in the body, my skin has returned to normal from congested state. That’s awesome to know Shay 🙂 It’s always great to have that lightbulb come on and find that whatever we do helps our skin right? It may not be conventional but if it works, hey let’s do it! Is the wagon too full to fit another me? 😛 Seems like lots of us are on the same bandwagon. Although I don’t have flaky skin, I have fine lines and semi-oily T-zone. So that would make me a combination-dehydrated-super-finicky skin, right? I’m not kidding when I say my skin is finicky. For example, I tried to “treat” the dehydration by switching to a slightly more hydrating toner, and it broke out like crazy. And it would only behave when I use a specific set of skin care. Did I mention that it’s an expensive combination of products? My current winter-skin savior is the Chanel La Nuit De Chanel. Does wonders. 😀 Hydrates without the oiliness. LOL Never too full to fit a fellow dehydrated skin sufferer 🙂 Gosh you’re right. Your skin is finicky! And Chanel works for you? Awesome! Ok, so not so awesome for your wallet but at least something does 🙂 That REN mask is nice right? It works well and I find it so much more gentle than most other types of similar masks. I’ve been told that I have dehydrated skin, it’s tight but oily. I tend to stay away from products formulated for oily skin because many times they are too harsh and irritate my skin. I try to use cleansers that are formulated to moisturize skin and are mostly non-foaming which helps a bit with the tight feeling in my skin. Have you read Dr Leslie Baumann’s book “Skin Type Solution”? She’s quite famous in the US. She doesn’t believe in the 4 traditional categories for skin type. In the book there is a long questionaire about your skin and lifestyle. From the answers you fall into one of 16 skin types. Each skin type has it’s own chapter in the book which discusses what kinds of products might help your skin and ingredients to look for in products and what ingredients to avoid. Also what cosmetic procedures might be beneficial for your skin type. According to the test I’m oily, sensitive, nonpigmented and wrinkled. I took a bit of offense at the wrinkled part since I’m not wrinkled yet but have the tendency to show signs of ageing early due to a childhood of living in sunny Florida with no sunscreen and living in a house full of second hand smoke.